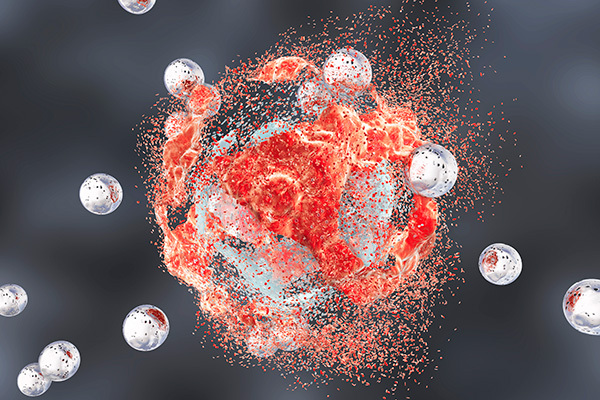 Thermal self-regulating nanoparticles that seek out and destroy cancer cells may sound like something pulled from the new Blade Runner movie script, but researchers at the University of Surrey have developed the therapy for use today. The “intelligent” nanoparticle, which heats up to a temperature high enough to kill cancerous cells, self-regulate and lose heat before they get hot enough to harm healthy tissue. Findings from the new study—published today in Nanoscale in an article entitled “Novel Nanoparticles with Cr3+ Substituted Ferrite for Self-Regulating Temperature Hyperthermia”—could soon be used as part of hyperthermic thermotherapy to treat patients with cancer. Thermotherapy has long been used as a treatment method for cancer, but it is difficult to treat patients without damaging healthy cells. However, tumor cells can be weakened or killed without affecting normal tissue if temperatures can be controlled accurately within a range of 42°C to 45°C. The Zn–Co–Cr ferrite nanoparticles produced for this study are self-regulating, meaning that they self-stop heating when they reach temperatures over 45°C. Importantly, the nanoparticles are also low in toxicity and are unlikely to cause permanent damage to the body. Previous articleCan Zinc Fingers Zip Along?